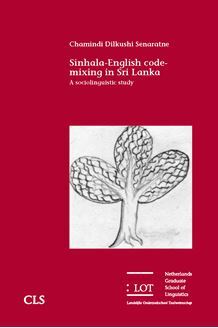 This thesis presents a study of code-mixing (CM) between Sinhala and English from the perspective of typology and sociolinguistics. The first part is intro ductory and a description of the two languages under study. Accordingly, it deals with the origins, social context and structural properties of Sinhala and English, relevant to this study. The second part focuses on the sociolinguistic embedding of multilingualism in Sri Lanka. The findings reveal that most urban Sri Lankans code-mix in daily conversation and that CM is an alternate code to Sinhala. The third part represents the analytic core of the thesis. The language analysis based on the structural elements of the mixed constructions, elaborates on four mixed types found in the Sinhala-English bilingual corpus namely CM, borrowing, hybridization and Sinhalization. Each of these phenomena has its own structural properties, modeled most dominantly on Sinhala syntax, phonology and morphology. The findings prove that the contact between Sinhala and English has resulted in phonological extensions and reductions in the mixed types. The morpho­syntactic features of Sinhala-English CM not only suggest that it is closely affiliated to the syntax of Sinhala but also that it has borrowed flexible features from English. Despite the extensions and reductions that Sinhala-English CM has undergone in its development to present day status of ‘vernacular’ in urban Sri Lankan society, in functional terms, it appears as a tool that has successfully acculturated the English language within Sinhala culture. In essence, CM has successfully brought together two typologically and culturally distant languages and reveals the acculturization of English by the native Sinhala speaker in Sri Lanka.